Charm is what this basket says. This generous fruit and gourmet gift basket is an arrangement that will bring a smile to a family member, friend or business contact. 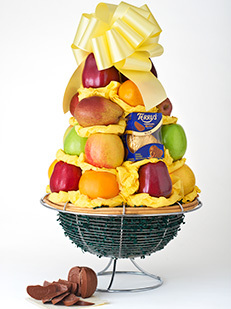 Packed in this gourmet fruit gift basket is a large assortment of fresh seasonal fruit, including Red Delicious apples, Granny Smith apples, Bosc and D'Anjou pears, Navel oranges, and other seasonal fruits and to top it off, a yummy chocolate orange!